Recorded in September for In Concert — BBC Television Theatre. 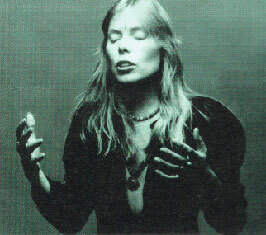 Joni is featured on guitar, piano and dulcimer. Broadcast on October 9, 1970. With all the great songs Joni has done over the years, you have to wonder why so many people are so enamored of "Big Yellow Taxi," one of her most commercial and least interesting numbers. Nonetheless, she is pretty here, and obviously a little nervous and unsure of herself, which is always endearing.